First off, the problem. When you take a VM snapshot of a VMFS-based VM, there is a performance penalty. This is due to the fact that when a snapshot is “created” what really happens is that a delta VMDK is instantiated. All new writes from that virtual machine go to the delta virtual disks, instead of the base VMDK. This makes that base VMDK store the point-in-time state of the virtual disk. This process is referred to as “redirect-on-write”. It is well understood that keeping these snapshots around is not a good idea-mainly due to the performance impact of this redirection. Basically, the rule is to not keep them for more than 24 hours, but really don’t keep them around longer than you have to. 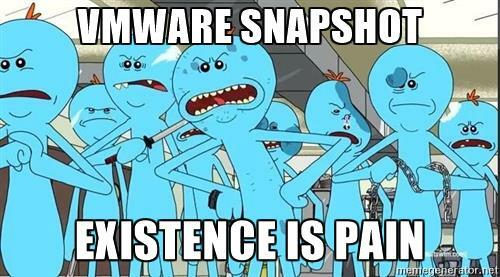 If something is about to happen (like a patch), take the VMware snapshot, install the patch, ensure nothing is broken, then remove the snapshot. Creation of the snapshot. This is short, but is actually the worst hit, as it actually pauses all I/O (if that option is chosen to quiesce the state). Existence of the snapshot. Here is where the redirection happens and all workload is impacted during this period. This is experienced as higher latency. Deletion of the snapshot. A snapshot is not just deleted. It is merged back into the original VMDK, so this merge process can be quite impactful, especially if there are a lot of changes to merge. Doing 2,000 IOPS, 70% write, 4KB I/O size. Nothing crazy, but to elucidate the concept. So the VM experiences quite the penalty when this snapshot is present. The VMware snapshot was created at 7:23 AM, and the backup was complete at 6:28 pm which is when it started to delete the snapshot. The backup took ~11 hours. The VMware snapshot was around for ~11 hours. NOTE: I will note this example is a full backup, so subsequent incremental snapshots will very likely have a decreased backup duration, but this time still can be significant if the VM has a high change rate in between scheduled backups. The VM snapshot delete took time too (87 minutes), and this is somewhat unavoidable. But the bulk of the time was the backup (665 minutes) and this is what the integration seeks to shorten, which has the biggest impact. That being said, the reduction of the snapshot lifetime should also in turn shorten the snapshot delete operation. So what does Rubrik do? 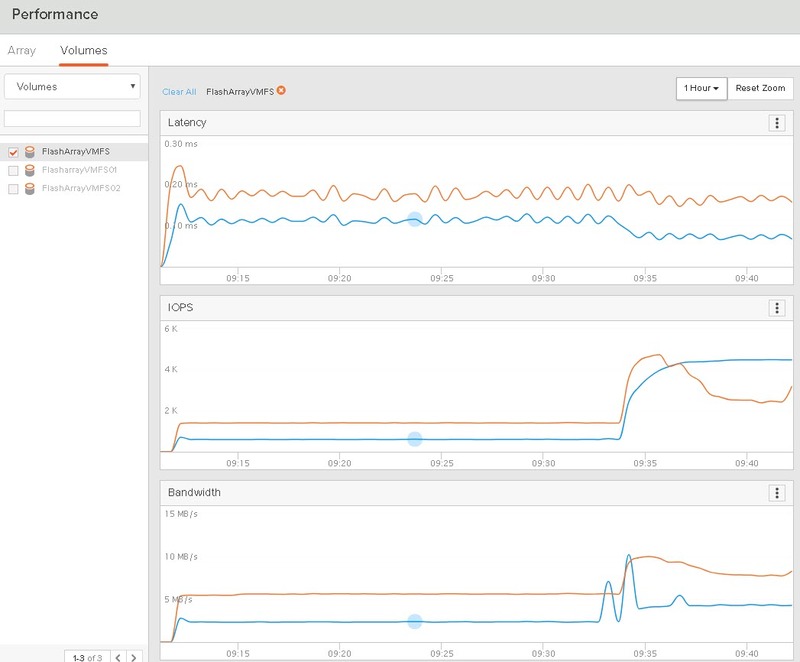 The goal here is to minimize the impact from a performance perspective to the VM targeted for backup. 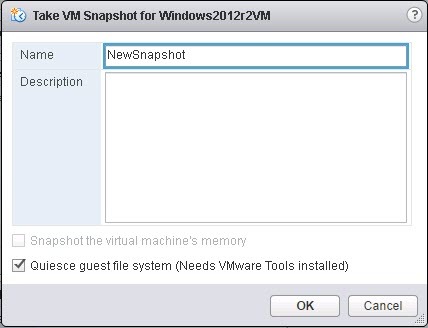 The most obvious way to do this is to reduce the duration that the VMware snapshot exists. The benefit here is that unlike in the original process where the VMware snapshot exists for 11 hours, it only exists for seconds. Really reducing the impact duration on the VM. Zero-performance impacting. They are not copy-on-write, they are not redirect-on-write. They are simply metadata preservations of the point-in-time of the volume. No data is moved or redirected. So no performance is hurt when a FlashArray snapshot is created, in existence, or deleted. Immediately created. It doesn’t take more than a few ms to create a FlashArray snapshot, regardless of size. So there is no waiting on one to be created. 100% data reduced. There is no capacity impact on the FlashArray when creating a snapshot. As data changes on the array, the snapshot might start to have some unique data stored by it, but since data is globally reduced it is unlikely to be a large amount, especially since it is temporary. Setup is pretty easy. 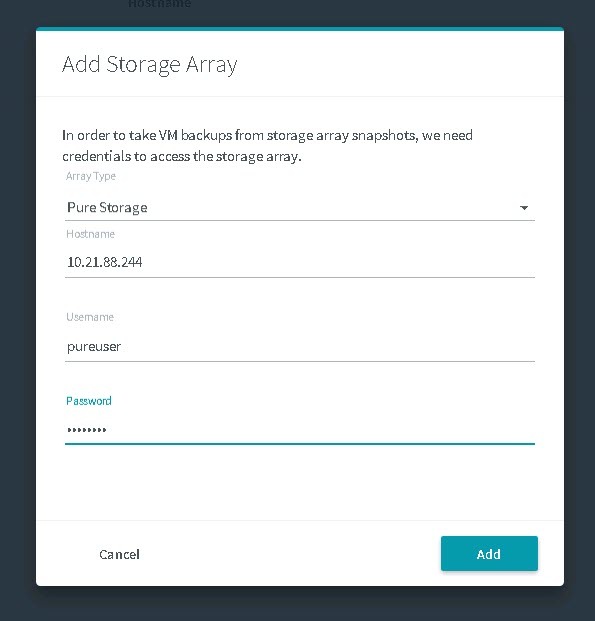 Go into you Rubrik interface and first add your FlashArray. You just need your IP/FQDN and username/password. If you do not see the “Enable Array Integration” option, make sure you added the right FlashArray. 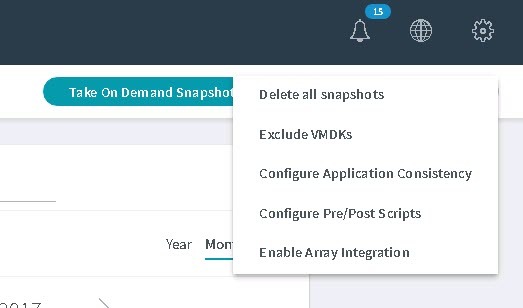 Also, find your vCenter in the Rubrik interface and choose “refresh”. That did the trick for me. And that is it! Pretty simple. 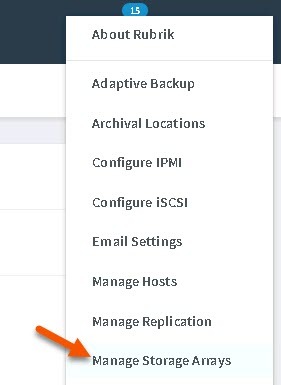 So from now on, any on-demand or scheduled backups will use the array to offload the process. Very simple! So a couple things to note here. First off the overall backup time is pretty much the same. This is expected. What is different is how long the VMware snapshot exists on the source VM. 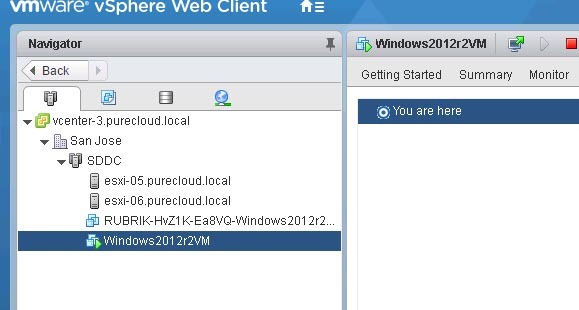 The VMware snapshot is created at 8:04 AM and then the deletion starts less than a minute later. So the “existence” of the VMware snapshot is down from 665 minutes to less than 1. The deletion itself completes 44 minutes later at 8:49. So the deletion time is reduced as well, from 87 minutes to 44. So the total impact time to the VM being backed up is reduced from 752 minutes (12.5 hrs) to 45 minutes. Not bad at all! Cody, great write up as always. Does this process scale if there 20 VM’s to back on the same data store? Or does it run serially doing each VM snap / backup before moving to the next. Also are individual file or VM recovery still possible? So the answer is that the backups will run at the same time, but each VM will have its own copy of the datastore during the backup. 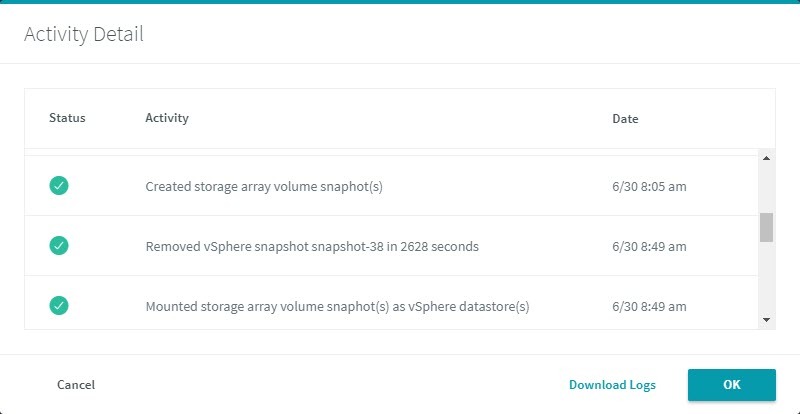 Due to dedupe on the FlashArray this isn’t a huge deal from a capacity standpoint, but I could see some benefit from temporary datastore sharing. I passed your comment on to Rubrik! I just tested this with vVols, and array based integration is not available for a VM on vVols. Do you know if Rubrik/Pure has plans to support this? I plan to reach out to my Rubrik team as well. We are having pretty major issues with our spangly new Pure/Rubrik backup combo. When we are running backups we are hitting the 5000 VVOL limit on the Pure array (a combo of active volumes and destroyed volumes), which then causes major issues. Would you advise we use VVols or should be move back to VMFS? Also we can’t get an answer if as part of normal backup operations should there be an eradicate issued on the recently destroyed volumes….? Any light you can shed would be great. Sorry I’m out of office last week and this week for my honeymoon so likely this was brought to me internally but I’m not checking email until I return. We are working on scale improvements right now so most of the issues around that should go away this year, so moving entirely off VVols probably isn’t the right answer, most customers I have seen (who are in similar scale limits) do some level of hybrid until we get some scale improvements. VVols for the VMs that really can benefit the most from them. The only time we eradicate objects immediately is the swap and certain snapshots we take for CBT differentials, but standard managed snapshots (that manifest as volumes) are not eradicated because there is a chance they might need to be recovered. I have been thinking about VVols and backup strategies lately and I think VVols might change how this is managed. When I get back we should have a chat. Please ask you account team to set something up.